Does Your eLearning Give People Nightmares? Have you ever watched an animated movie or played a video game and felt uncomfortable, like something was not quite right? You may have experienced the “uncanny valley.” This theory, first posed by robotics professor Masahiro Mori, states that there is a “valley” where figures look almost human, but not enough to be 100% convincing. This causes us to react with revulsion, because the imperfections cause us to become deeply unsettled. The effect decreases the less human the figures appear. If elearning courses use 3D models or animations that fit into the uncanny valley, it’s likely that the viewer will lose interest and subconsciously value the course less. Below, I’ve included examples and tips on how to avoid the uncanny valley, as well as increase the value and likeability of your elearning course. Famous examples of the uncanny valley include the films Polar Express and Mars Needs Moms, where the characters have jerky movements, “soulless” eyes, or slight imperfections compared to real humans. Because of this, the films received universal derision and even caused animation departments to close. Other examples include Beowulf, video games like L.A. Noire, and humanoid robots such as the receptionist robot or the dental training robot. Why do we react negatively? There are several explanations for why we dislike the uncanny valley so much. The first is that we are tuned evolutionarily to distrust and avoid diseased people. When we see human figures that appear off, its a clue that they are infectious, diseased, or harmful, and so we instinctively avoid humans who are noticeably different. The second is we are naturally afraid of surprises. When a figure that looks like a human moves or talks differently than we would expect a human to act, we encounter an “error” in our brains and try to distance ourselves from that error. So how does this affect elearning? Many courses use simulations and animations as a way to get the learner more invested in the course. However, as psychologist Andrew Olney explains, interaction with a figure in the uncanny valley sets off fearful and distrustful instincts. If a CGI figure is supposed to teach new information, or guide the learner through the course, then a suspicious reaction from the learner will negatively impact the learning experience, and devalue whatever information the figure is supposed to be teaching. Moreover, if learners feel disgust or uncomfort while taking a course, they will be less excited and willing to take courses in the future. 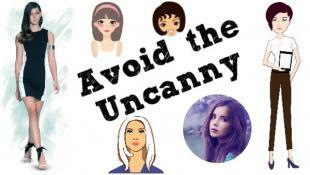 What can you do to avoid the Uncanny Valley? If you’re using simulations, try to make the figures distinctively cartoonish. Human CGI characters that are still empathetic are characters such as Mr. Incredible or Queen Elsa. These characters have deliberately exaggerated features that distinguish them from humans, and so we don’t distrust them. 2D animation is always less risky than 3D. 2D characters don’t run the risk of falling in the uncanny valley, and are generally more successful at interacting with humans. When using 3D models, avoid animating them. If 3D models don’t move, we don’t experience the cognitive dissonance that arises from a humanoid moving in a non-human fashion. Learners will react much more positively to 3D models if they don’t move. Be careful when using anthropomorphized characters—If they’re cartoonish, they can end up being great visual aids. Make them look too human, however, and you end up with the same uncanny valley problem as countless other courses. Finally, even though it may be obvious, humans trust other humans. When in doubt, use actors and life-action videos over animations. Students will relate better to them, and the situations portrayed in the videos will often be more applicable to real life. Learn about this and other elements of elearning design in our Master Design and Development Bundle or get started with Create Your Own eLearning Courses!